Fatigue is sometimes a normal experience and part of normal physiology. 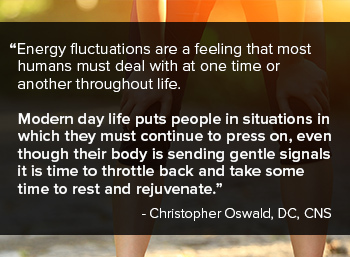 Energy fluctuations are a feeling that most humans must deal with at one time or another throughout life. Modern day life puts people in situations in which they must continue to press on, even though their body is sending gentle signals it is time to throttle back and take some time to rest and rejuvenate. The human body is quite amazing in its ability to remain functioning at a high level, even in suboptimal circumstances due to redundancies in human physiology. The challenge with this type of lifestyle which so many live is understanding when the body has been pushed too far, when the symptoms of occasional physical and mental fatigue have crossed the threshold, and all, or most, redundant systems have been exhausted and must be addressed with focused evaluation and appropriate support to maintain an individual’s health. Acute fatigue is a completely normal process, which happens to be a protective mechanism, often linked to a single cause. Identify the cause, whether it be diet, exercise, sleep, or stress, modify the factor, and the fatigue should ameliorate fairly rapidly.1 A sprint causes acute fatigue. Recovering is the answer. The real issue at hand is to determine when the fatigue one feels is not the protective, acute fatigue, which essentially is telling someone to take a short break, and providing more intensive support to, at times, overlooked aspects within the body which help to regulate and provide energy for the body. When evaluating the causes of fatigue, it is important to remember that just because fatigue is present, doesn’t mean the body is not operating appropriately. Properly assessing the potential underlying causes of fatigue will aid in providing appropriate support. One must acquire a detailed history as this may reveal poor dietary habits, sleep, or exercise patterns which are resulting in the body to function healthily, as it is sending signals requesting more rest, better food, or some exercise. The task of identifying when fatigue is more than just a simple signal due to a solitary factor is daunting though. While many become quite concerned with occasional fatigue, one must understand it may be a completely normal response to daily life and the body is just screaming for a period of relief and rejuvenation. It is important to understand the factors which point to need of evaluation and support of the pathways and organelles which are important to providing healthy energy levels. Once you have considered all of the pieces of the puzzle before you, then it becomes far easier to determine to most effective plan. Christopher Oswald is a chiropractor, certified nutrition specialist, and a graduate of Northwestern Health Sciences University. He practices in Wisconsin, focusing on whole body care for those suffering from head and neck pain. In practice he utilizes the combination of functional movement assessment and functional medicine principles to identify the underlying causes, which guides his direction for the appropriate clinical care. Additionally, he is an Advisory Board Member of Nordic Naturals, and the National Association of Nutrition Professionals. Silverman MN, Heim CM, Nater UM, Marques AH, Sternberg EM. Neuroendocrine and immune contributors to fatigue. PM R. 2010;2(5):338-46. Raison CL, Lin JMS, Reeves WC. Association of peripheral … in a population-based sample. Brain Behav Immun. 2009;23:327–37. Chrousos GP. Stress and disorders of the stress system. Nat Rev Endocrinol. 2009;5:374–81. Tanaka H, Matsushima R, Tamai H, Kajimoto Y. Impaired postural cerebral hemodynamics in young patients with ... J Pediatr. 2002;140:412–7. Gorman GS, Elson JL, Newman J, et al. Perceived fatigue is highly prevalent and debilitating in patients with mitochondrial ... Neuromuscular Disorders. 2015;25(7):563-6. Morris G, Berk M. The many roads to mitochondrial ... BMC Med. 2015;13:68. Jason LA, Sunnquist M, Brown A, et al. …Fatigue Biomed Heal Behav. 2015;3(3):127-41.